Thomas Paine was the most influential radical writer of his day. During his life he fought for the rights of ordinary people against the unrepresentative power of monarchs and parliaments, writing on behalf of those who could not speak for themselves and helping to bring about a popular movement of ordinary working people. In 1774 Paine emigrated to Philadelphia and in January 1776 wrote Common Sense. Common Sense personally attacked King George III for neglecting the American people and violating their human rights. It publicly set out the arguments for independence and made Paine the most popular and widely read writer of the American Revolution. Inspired by the success of the revolutionaries, Paine set out “to write a Constitution for the English nation.” (Paine’s Biographer). In 1791 and 1792 he published The Rights of Man. Part one of The Rights of Man attacks the British Constitution for being outdated, unwritten and based on power handed down from father to son. Paine instead argues that government is based upon every individual having the right to the vote (though they must be male and of minimum age). Part two gave people an idea of government and society in a democratic future, setting out a plan for a system of progressive taxation to provide old age pensions, free education and out-of-work benefits. Paine claimed democracy would increase the “general happiness” and eradicate poverty and all the misery which it brought. By 1793 around 200,000 copies of the second part of The Rights of Man were in circulation in a population of 10 million. It was read aloud in meeting places, coffee houses and pubs to whole groups at a time. It was easily understood by people who had no formal education and copies were passed on between comrades. 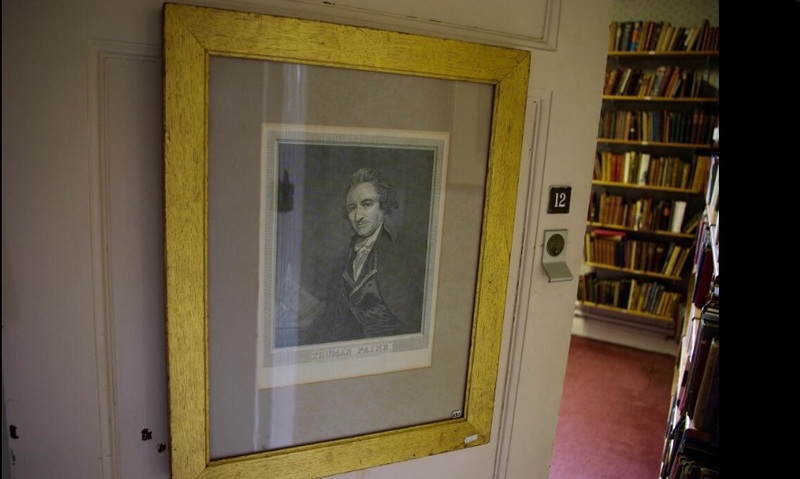 Just down the road in the Working Class Movement Library is the largest Paine collection in the country. It was assembled over fifty years by father then son, Adrian and Christian Brunel. These images give just a flavour of the books, pamphlets, prints, tokens and ephemera ready for you to explore. This entry was posted in QR Codes. Bookmark the permalink.